Engineered stone is man-made. Ground up quartz is mixed with resin and color(s) to create pseudo-stone designs. By weight, the material is about 90% stone. The raw material usually arrives in slabs (10’ x 4.7’) much the same way natural stone (8.5’ x 4.5’) is delivered. One of the attractions of engineered stone is that it has a three-dimensional natural look. Color consistency is usually the biggest draw, however. The reliable color component is really awesome if your color scheme requires a predictable palette. 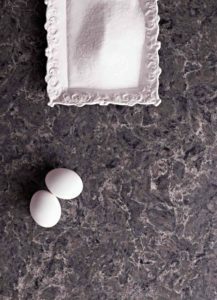 Also, if you think you might like marble in your kitchen, engineered stone offers an excellent alternative. Have questions? Like Granite, the quartz and resin in engineered stone is non-porous so it resists staining. Although the material itself is usually more expensive, engineered stone is a similarly priced product in the end. Engineered stone can be as beautiful as natural stone and often times more appropriate. It is more predictable in color and can sustain exacting edging cuts for falls and other precision applications. Contact us for more information. 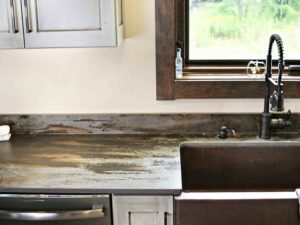 Stone Kitchens is a dealer for the best manufacturers in this group. Here are a few; Caesar Stone, Dekton, Viatera, Silestone, Hanstone, Corian Quartz, and Mont Quartz surfaces.